My late mother, the wise Filipina, would always say, “Your health is your wealth.” And when her health failed, she was thankful for her health care through Medicare. And now after today, we’re a step closer to the danger zone. I talk about #TrumpNoCare on the podcast. But we won’t let the threat to health care mar Asian American and Pacific Islander Heritage Month. And if you’re wondering, yes, Donald Trump did tweet about it. His proclamation mentioned Dr. Sammy Lee, the great Olympic diver and the first Asian American man to win an Olympic gold medal in the 1948 Olympics. He also mentioned Katherine Sui Fun Cheung, who embodied the spirit of this month. In 1932, she was the first Chinese American woman to earn a pilot license at a time when only one percent of all pilots in the U.S. were women. Trump, of course, likes any 1 percenter of any kind. Trump’s proclamation was fairly boilerplate, as you’d expect from a man who thinks diversity is identity politics and not a hallmark of a nation that believes in equality. Trump even cites Public Law 102-450, which makes May each year “Asian/Pacific American Heritage Month. “I encourage all Americans to learn more about our Asian American, Native Hawaiian, and Pacific Islander heritage, and to observe this month with appropriate programs and activities,” Trump proclaimed. Let’s see if he takes his own advice, and learns how many Asian Americans will be threatened by his #TrumpNoCare. 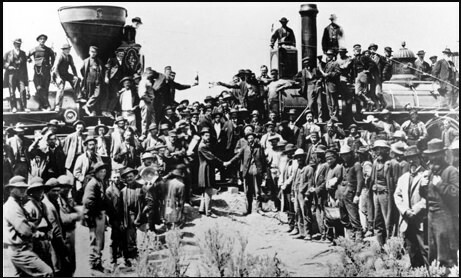 Or we can just go back in history with that legendary picture of the railroads and the Golden Spike uniting America by rail. You’ve seen it, right? Photographer Corky Lee saw it when he was a kid growing up in New York. It was the first mention of any Chinese people that he saw in his history books. The text said Chinese people helped build the railroad. But Corky didn’t see any Chinese in the picture. On the AALDEF podcast, Emil Amok’s Takeout, Corky said he bought the best magnifying glass he could find at Woolworth’s. And he still couldn’t see any Chinese. “We were excluded again,” he told me. May is quite a month. May 6 is the 135th Anniversary of the Chinese Exclusion Act, signed into law by President Chester A. Arthur in 1882. But May 10 is the 148th anniversary of the photographic exclusion that has been bothering Corky since he first saw that picture of the Golden Spike at Promontory Summit, Utah. On May 10, Corky will stage a flash mob photo, hoping for people coming in period dress to do what people have done for years. Only Corky wants to make a picture with actual Chinese people–like the people who built the railroads. He’s been doing it as a matter of tradition for the last few years, his build-up to a grand 150th anniversary shot. 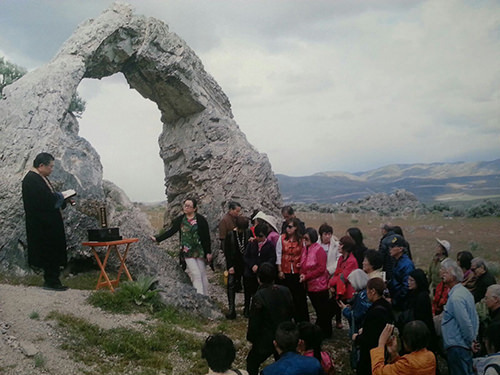 One year, it was the Buddhist ceremony at the Chinese Arch, believed to be the first one ever. Go ahead, make a pilgrimage to Utah for AAPI Heritage Month. I doubt if The Donald will be there. Find out more by going to Corky Lee’s Facebook page. Listen to the podcast on how Corky developed his sense of “photographic justice,” and how the activist’s heart merged with the photographer’s eye to produce some of the most memorable photographs of modern Asian American life ever taken. Corky talks about his first camera and his father’s style of teaching. And several times throughout, he talks about the picture that has been his driving force to include Asian Americans in everything he sees through the lens.